Weird Wonderful Web: What if you need an inflatable colon? What if you need an inflatable colon? You know what it's like. A buddy calls up and says "hey man, can I come round and borrow ya large scale, walk-in, inflatable colon? Mine's in the shop at the moment and I've got guests coming round!". Well what do you do in these (all too common) situations? You contact these guys of course! The Inflatable Design Group has got an inflatable in the shape of pretty much anything you can think of. And, if they haven't already, then they can make custom inflatables to pretty much anything you can think of. But don't worry, it's not all giant, walk-in replicas of colons and such. 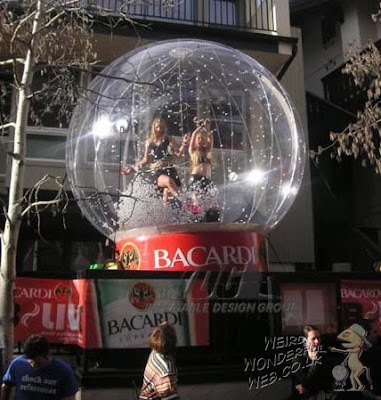 They also do glamorous inflatables - like this wonderful giant snow globe. Norwegian frogmen versus Google cam car!